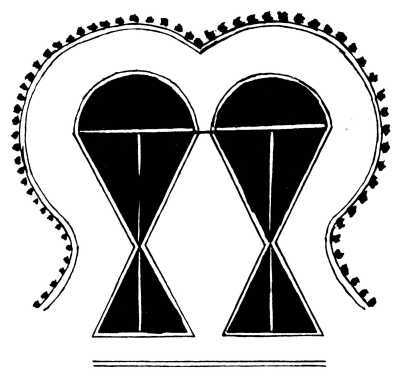 Two yantras from Rajasthan in Tantra Art by Ajit Mookerjee (1971 edition, plates 43 and 45). “The dynamic graph of the diagram of forces by which anything can be represented—the picture of its functional constitution—is called the yantra of that thing. 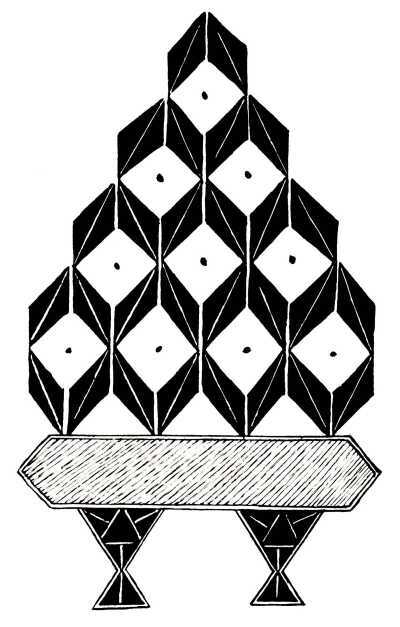 It is not an arbitrary invention but a revealed image of an aspect of cosmic structure” (p20). The yantra below “tries to express primordial vibrations, or spandas, the ‘cosmic drum of sound’, which by their lines of sound-energy create a dual ‘magnetic field’. Here vibrations are slowed down at laya (absorption) points” (p80). “And just as the musical string must be plucked in a particular fashion to sound a certain note, so must the yantra line be mastered and mentally plucked to bring forth its image or power” (p21). am looking for extensive information on the damru yantra, could you direct me to sources? I am designing a logo for an children’s learning project we have christened Damroo and am tryng to design an appropriate logo. Thanks.